Since last week marked the first wedding anniversary of Prince Nikolaos and Princess Tatiana, and Queen Anne-Marie's birthday was earlier this week, I thought we should celebrate with the first Greek tiara to appear here on Tiara Thursdays. The diamond and pearl Antique Corsage Tiara has a history that passes it through the hands of Queens from three different countries. Queen Victoria of Sweden owned a stomacher that could be used as a set of brooches. This piece was inherited by Queen Ingrid of Denmark (who was Victoria's granddaughter). 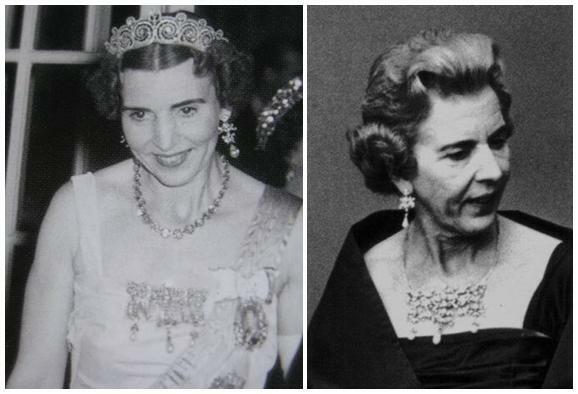 Ingrid set the brooches up as a tiara and gave it to her daughter, Princess Anne-Marie, as an 18th birthday present. She's now established the piece as something of a starter tiara amongst the Greek royal family, which makes sense since the remainder of her collection consists of quite substantial pieces. 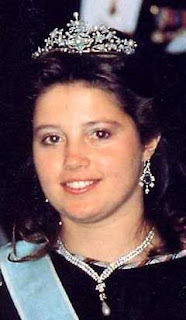 Princess Alexia borrowed the tiara from her mother as a young princess. She received a tiara of her own from her parents, and that is the only one we see her in now. 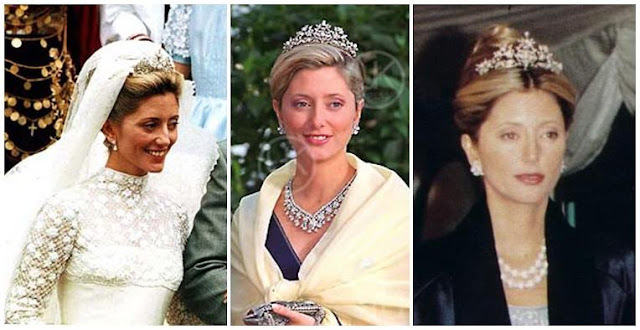 It is currently the only tiara we've seen on Princess Theodora, Anne-Marie's youngest daughter. Theodora's tiara appearances started quite young, and this is a great piece for a youthful princess: not too big, but nothing to sneeze at. It still says: why yes, I am a princess, thank you for asking. She lent it to Marie-Chantal Miller when she wed Crown Prince Pavlos, and for a few appearances early on in their marriage. Nowadays, M-C is most likely to be seen in a fringe tiara that is thought to be her personal property. And she repeated her wedding loan policy when Tatiana Blatnik wore this piece to wed Prince Nikolaos one year ago. What we need now, crafty magpie friends of mine, is a tiara event grand enough for both Tatiana and Theodora to appear, so we can see how the tiara lending policy will shake out. Everybody cross your fingers. Who wears this one best?